The revised and updated edition of The Myth of Saint Thomas and the Mylapore Shiva Temple is now available on its own website. It is a complete study of the St. Thomas in India legend — its origin, history, ideology, and communal ramifications — and is named after the main, 24-chapter essay by Ishwar Sharan. It includes 28 independent, penetrating articles by senior journalists and scholars, and exposes in detail the anti-Hindu bias in India’s secular English-language media. One chapter deals with the pronounced Christian bias of the Encyclopedia Britannica and popular online reference portal Wikipedia. Both encyclopedia’s carry fanciful, non-factual entries for St. Thomas the Apostle in India that they refuse to correct or change. The book documents the destruction of the original Kapaleeswara Shiva Temple by the Portuguese and its replacement by the San Thome Cathedral Basilica on the Mylapore beach in Chennai. This online edition can be easily searched using the search fields at the top the side bar. There are many relevant reference links including a link to the original 3rd century Syrian religious romance, the infamous Acts of Thomas by Bardesanes, which is the source of the legend of St. Thomas in India. The Myth of Saint Thomas and the Mylapore Shiva Temple – 2010, is available from publisher Voice of India, New Delhi. It can be read full screen or downloaded free here. The book has an extensive bibliography and is a valuable tool for researchers and historians. Indologist Dr. Koenraad Elst has written a comprehensive foreword for the new edition. His short foreword to the 1995 edition is posted here as he makes some pertinent remarks about Indian secularists and their uncritical acceptance of Christian mythology as Indian history. According to Christian leaders in India, the apostle Thomas came to India in 52 AD, founded the Syrian Christian Church, and was killed by the fanatical Brahmins in 72 AD. Near the site of his martyrdom, the St. Thomas Church was built. In fact this apostle never came to India. The Christian community in South India was founded by a merchant called Knai Thoma or Thomas of Cana in 345 AD — a name which readily explains the Thomas legend. He led four hundred refugees who fled persecution in Persia and were given asylum by the Hindu authorities. In Catholic universities in Europe, the myth of the apostle Thomas going to India is no longer taught as history, but in India it is still considered useful. Even many vocal “secularists” who attack the Hindus for “relying on myth” in the Ayodhya affair, off-hand profess their belief in the Thomas myth. The important point is that Thomas can be upheld as a martyr and the Brahmins decried as fanatics. In reality, the missionaries were very disgruntled that the damned Hindus refused to give them martyrs (whose blood is welcomed as “the seed of the faith”), so they had to invent one. 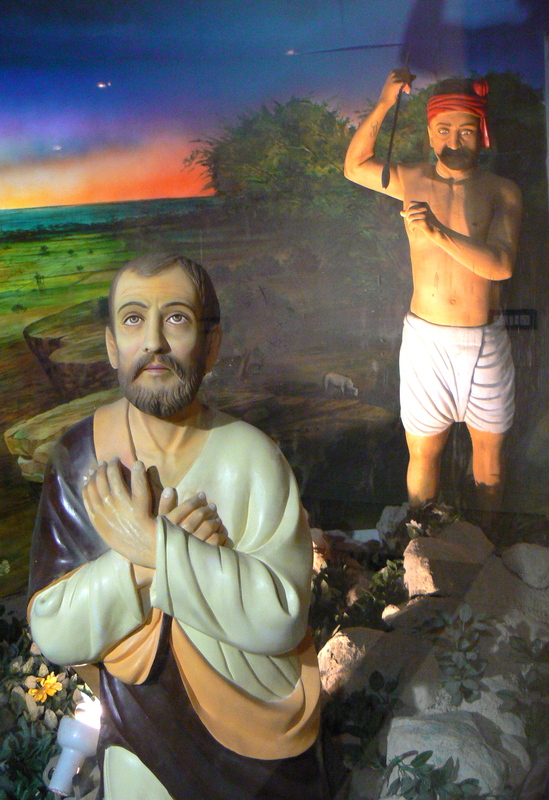 Moreover, the church which they claim commemorates St.Thomas’s martyrdom at the hands of Hindu fanaticism, is in fact a monument of Hindu martyrdom at the hands of Christian fanaticism. It is a forcible replacement of two important Hindu temples — Jain and Shaiva — whose existence was insupportable to the Christian missionaries.